Whether you are looking for a last-minute Father’s Day gift or want to treat a favourite male for his birthday, the Dorco Classic Shave Gel Kit will doubtlessly make his day. Comprising of the Classic razor handle, 5 cartridges and a 150 ml tube of Dorco’s new shaving gel, this excellent set has everything your dad, husband, brother or uncle needs to have a perfectly smooth and exceptionally close shave. Combining its ergonomic non-slip design and seamless, vintage-style construction with a pivoting head, seven ultra-sharp, precision aligned blades and a lubricating strip enhanced with soothing calendula extract and nourishing Argan oil, the Dorco Classic razor doesn’t just give you a shave, it massages your face – soothing dry skin, nourishing and moisturising sensitive skin and raising your hair follicles to give you a smooth, close shave. 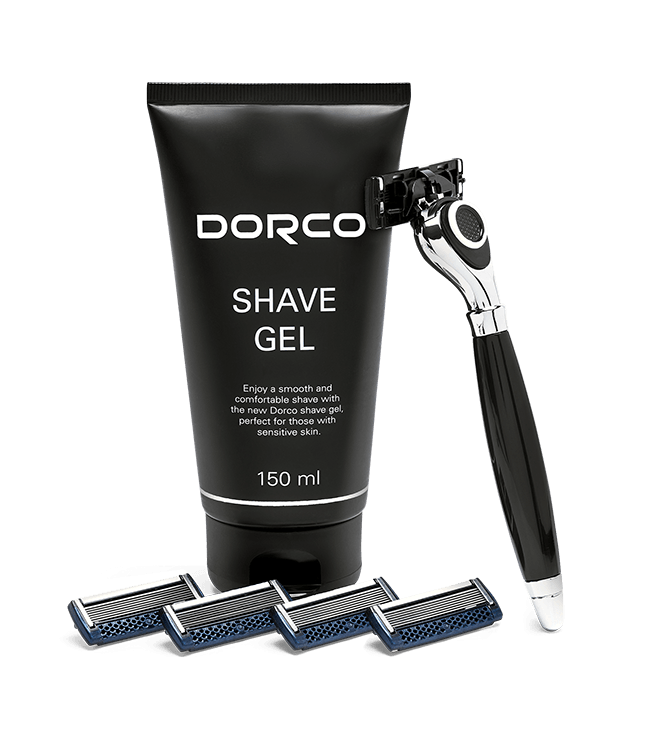 The soothing, moisturising effect of the lubricating strip is added to by Dorco’s new shave gel, which has been specifically formulated to help protect, nourish and soothe sensitive skin. The complete kit is currently available from Dorco at a reduced price of just £17.81. My husband tried the Dorco Classic out for me and, while he is extremely pleased (which is high praise indeed, as he is extremely fussy when it comes to shaving), I am not happy with the results – because his skin is as smooth as a baby’s bottom and I do so like a bit of stubble, lol. All in all, I can safely say this kit is well worth its price even at its regular RRP of £21.27. Highly recommended as a gift for all occasions.